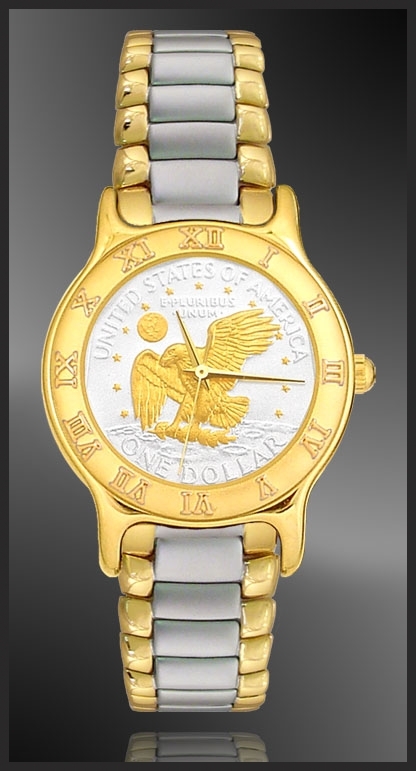 Apollo Landing Eagle Dollar Ladies Bracelet Coin Watch: The dial is the reverse of a handpicked US Mint issued Susan B. Anthony Dollar enhanced with AureTone ™ extreme precision 24K gold accents. Swiss movement, stainless steel case & bracelet. America's eagle over the lunar landscape commemorates the triumphant Apollo 11 mission, the first moon landing. This Lexington ladies watch is our finest quality providing reliable, precision performance. 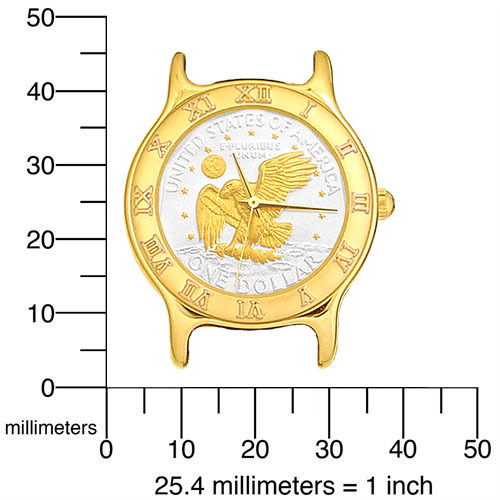 The dial is the reverse of a handpicked US Mint issued Susan B. Anthony Dollar (27mm diameter) enhanced with AureTone ™ extreme precision 24K gold accents. A genuine Swiss quartz movement powers each watch, which is secured within a stylish stainless steel case and 3 micron heavy gold plated bi-tone bracelet. Each includes a lifetime warranty against defect and is accompanied by a unique numbered signet and certificate of authenticity.